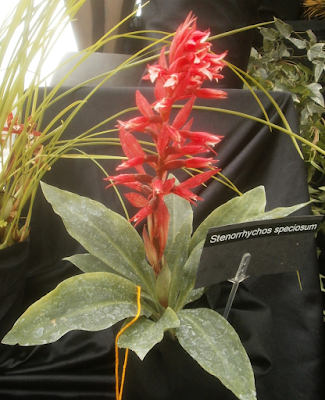 This was the second year I've seen Stenorrhynchos speciosum at the orchid show (the first being 2011). Better full-plant photo this time around, but the close-up was worse. There are, of course, even better photos to be found of this species on other sites. 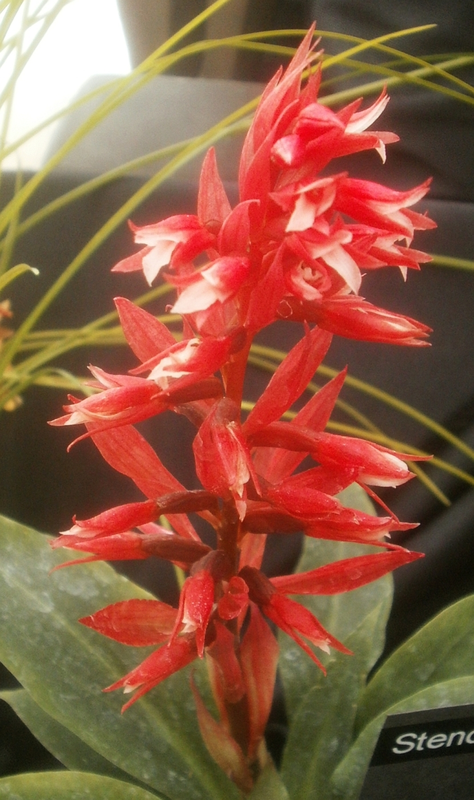 I'm particularly interested in the photos at davesgarden.com, which show a specimen with spotted leaves. I like the foliage on this species anyway, but the spotted version is even more interesting. Location: shady yard, Iowa. She didn't plant it deliberately but would like more of them. Anybody recognize it? By the way: Mom acknowledges that it maybe isn't the healthiest larkspur in the world, but considering that she's done nothing to care for it (she never even planted it there in the first place), she figures it's doing pretty well for itself.